While strolling down New York’s lower Broadway during 1888, Angus Hibbard observed that trade signs painted blue and white seemed to stand out the best. At the time Angus Hibbard was the general superintendent for American Telephone and Telegraph Company (AT&T) then referred to as the Long Distance Company. AT&T was established during 1885 as an American Bell Telephone Company subsidiary. Its purpose was to connect distant cities with long distance lines. Three years had gone by since AT&T’s founding and public pay phones were becoming more widespread. But the company had no standardized signing for marking long distance payphone locations. Having noticed signs painted blue and white attracted the eye, Angus had a thought. Many vendors and stores at the time advertised their wares or services by displaying large symbolic examples above the sidewalk. Why not symbolize Bell telephone service using the outline of a bell? Advertising is often related to the American consciousness through subliminal cultural themes. The Bell interests released its first telephone advertisement in May 1877 referring to Prof. Bell’s “Speaking and Singing Telephone.” An image of The Liberty Bell came to Angus’ mind coinciding with The American Bell Telephone Company named for the Bell patents and Alexander Graham Bell. Angus Hibbard set to work sketching renditions of an appropriate advertising sign. His first attempt included adopting the Liberty Bell shape in blue and attaching a set of wings indicating the flight or speed of modern telephone transmission. On the bell he included the words in white “LONG DISTANCE TELEPHONE.” The bell was set on a white background and Angus showed his sketch to Theodore Vail, then president of AT&T. Not far away in Wrentham, Massachusetts during autumn 1888, in New England Telephone & Telegraph Co. territory, a long distance public telephone station was placed in the local drug store looped to the Providence-Boston long distance line owned by AT&T. This became one of the first if not the first recorded locations for displaying the Blue Bell sign. Within a short period of time, the Blue Bell sign appeared in the states where AT&T built long lines and established long distance public telephone stations. The “LONG DISTANCE TELEPHONE” signs became available in etched glass for use as windows in early long distance telephone booths and in iron enamel. Glass signs measuring 6”x10” were offered by the Marsland Co. of NYC. Marsland also provided the same message on its iron enamel signs often affixed to a wooden signboard hanging from a bracket over the sidewalk. 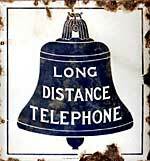 Another set of “LONG DISTANCE TELEPHONE” signs were produced for AT&T by a firm in England. These signs usually, but not always included a side- mounting bracket. Local Bell operating companies did not have the benefit of the Blue Bell sign before 1895 when the word ”LOCAL” was added to the wording “LONG DISTANCE TELEPHONE.” This was done to indicate that exchange as well as long distance service was available wherever the sign was displayed. 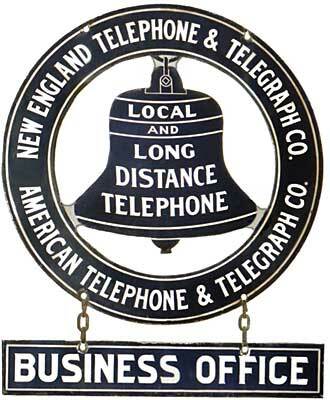 The original “LONG DISTANCE TELEPHONE” signs often remained displayed in locations where non-Bell operating Companies provided local service well into the 20th century. Theodore Vail being an astute businessman decided the Blue Bell symbol should be registered. Unknown to Vail and others in the Bell organization, using the likeness of the liberty bell was a popular theme. Upon application to the US Copy Right Office they discovered a similar trade -mark had been registered to a fish dealer in Boston. It would be many years before the Blue Bell image became registered as a service mark. 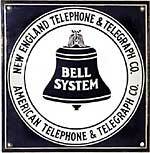 New England, being the home of the American Bell Telephone Co., became the breeding ground for early Bell licensed companies. The Southern New England Telephone Company became an early player not only in exchange service to Connecticut but in toll service to eastern New England as well. Its toll lines extended into Massachusetts and through Rhode Island. A key figure involved in New England telephone history was Marshall Jewell who served as President of the Southern New England Telephone Company. His plan was to create one Bell operating company for all of New England. His untimely death during early 1883, thwarted the consolidation of the Southern New England, the Connecticut, the Inter State, the Providence, the Boston and Northern, the National Bell Telephone Company of Maine, the Bay State, the Granite State, the Suburban, the Ingham, Glidden and Downe and the Southern Massachusetts Telephone Company. From the turmoil following Marshall Jewell’s death and the loss of his great personal prestige and political influence emerged New England Telephone & Telegraph Company. New England Telephone & Telegraph Company was chartered on October 19,1883 under the laws of New York State. It consolidated the Telephone Dispatch Company, the National Bell Telephone Company of Maine, the Boston and Northern Telephone Company, The Granite State Telephone Company and the Bay State and Suburban Telephone Company. Bell operating companies in Southeastern Massachusetts, Rhode Island and Connecticut were not included. A little known company, New England Telephone & Telegraph Company of Massachusetts was chartered during 1888 for the purposes of maintaining "pole rights" with the Edison Electric Illuminating Company of Boston. It's parent company was NET&T. In essence NET&T became the “home” regional operating company for American Bell Telephone controlled by Boston financiers. Being chartered in New York provided NET&T with additional capital and led to the AT&T takeover of American Bell during 1900. Employees working for American Bell referred to the Bell licensed companies as the “System.” Although the term “Bell System” was adopted for use in the national media during 1908, there is considerable evidence that “Bell System” was used on signs before 1908 by NET&T possibly as early as 1900 when AT&T became the mother company. 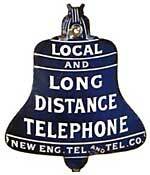 American Bell was dissolved by decree during 1921 when the next series of Bell System signs appeared. Realizing its image had become tarnished over complaints about poor service and predatory business practices regarding independent telephone companies, AT&T during 1903, retained the services of a public relations and advertising firm in Boston called The Publicity Bureau. This company attempted to create a new image for the Bell interests including AT&T. It is very probable that a new signing style was adopted following 1903. One of the most significant styles to emerge during this period was the circular band or wreath sign. The NET&T version included the familiar Local and Long Distance bell in the center surrounded by a blue band containing New England Telephone & Telegraph Company in the top portion and Bell System in the lower portion. The circular band has remained in different forms ever since. The Publicity Bureau continued to serve the Bell interests until 1907 when Theodore Vail returned as President of AT&T. He terminated the services of the Publicity Bureau and established his own PR department in the Company. Almost immediately he adopted the term “Bell System” for media advertising. As AT&T’s Publicity Department was designing the ’21 logo, an era of standardization was sweeping the US. Highway signing was being standardized and manufacturers were standardizing parts. Western Electric decided to standardize the Bell System’s telephone signs and numbered the ’21 sign set. The 8” round became No.1. The 11”x11” flat square became No.2 and its flanged counterpart No.3. The 2 ½”x10” flat “Coin Telephone” became No.4. The 5 ½”x19” single faced became No. 5 and its counterpart double faced with arrow became No. 6. The Blue Bell lamp shade became No. 7 and the canteen glass sign became No.8. As additional signs were needed such as the 18” round for use under awnings, they were numbered too. Each operating company was granted a unique set of numbered signs beginning with the 100 series. NET&T’s 16”x 16” flat was granted No. 101 and its counterpart flanged style No. 102. Pacific Tel’s No 102 was a gold lettered hand painted sign. The ’21 sign set, reflecting the colonial revival period of architecture, was implemented by 1921 and the Bell System enjoyed sustained growth until 1932 when the full effects of the great depression were felt in particular by Western Electric the Bell System supply company. Over 80% of Western’s employees lost their jobs. In an effort to cut costs the Bell System’s advertising budget was slashed. A revised logo was designed and put into service by 1939. 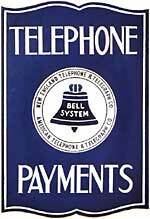 Its message was clear: PUBLIC TELEPHONE/BELL SYSTEM. However, regional identity had lost out to efficiency. Instead of stocking and ordering 8 different signs for 27 different companies, only 10 different signs or less required stocking. The ’39 sign was introduced by the Southern New England Telephone Company during 1938 and appears in photos taken during the great New England hurricane. The ’39 date appears to be arbitrary or a ”not later than date.” Some operating companies managed to preserve their regional identities. NET&T, perhaps the most prolific operating company in terms of different styles of telephone signs, chose to keep its ’21 signs in service as long as possible and added its name to at least four ’39 signs. Postwar changes to the Blue Bell occurred during 1964 and again during 1969. Both changes simplified the logo with the first eliminating the words “American Telephone and Telegraph Co. and Associated Companies and the second eliminating the wording “Bell System.” The 1969 logo remains with us today in very limited use by the remaining Baby Bells who choose to use it. For those of us who remember the days when the Blue Bell was the Bell System the term “Spirit of Service” remains in our hearts. Author’s interview with Mary Lyons, AT&T Archivist 1977. Larned, Larry. 1982. “American Telephone & Telegraph Company Born Under Non-Regulation Matured Under Regulation” MPA candidate Barney School of Business, University of Hartford, West Hartford, CT.